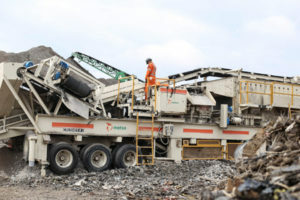 According to a new study by the Toronto and Area Road Builders Association (TARBA), many municipalities in Ontario dump asphalt and concrete in landfills instead of recycling these materials. As a result, every year, millions of tonnes of this material are stockpiled in mountains of urban rubble or dumped in landfills instead of being reused in municipal infrastructure projects. “This is a terrible waste of a valuable resource,” says Rob Bradford, executive director of TARBA. Municipalities with low rates of concrete and asphalt recycling are also forfeiting opportunities to help the environment by lowering fuel consumption and greenhouse gas (GHG) emissions associated with trucking new aggregate, diverting used aggregate from the waste stream, lessening the impact of quarry operations, and building more sustainable infrastructure. According to a statement issued by TARBA, only about seven per cent of the aggregate needed in Ontario comes from recycled sources. In contrast, some European countries use up to 20 per cent recycled aggregate. Ontario’s Ministry of Transportation also employs about 20 per cent recycled materials in its highway construction.